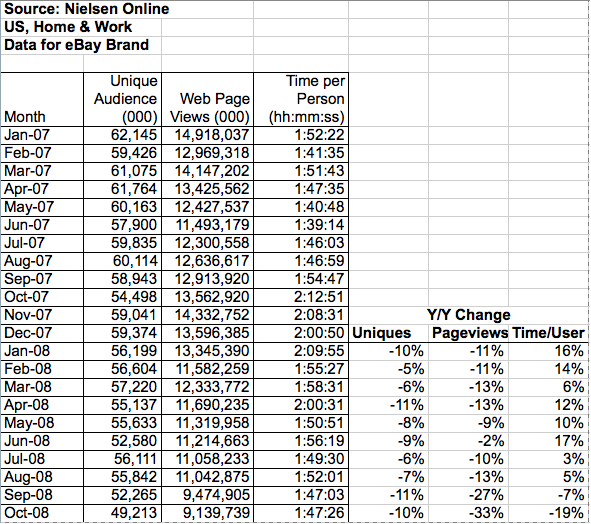 eBay has recently seen a sharp drop in traffic as they cut their affiliate stream and Google ad spend. When you are a default category leader you no longer compete against others in your category. You compete against other categories. Google and Amazon.com understand that. Microsoft maybe. eBay no. eBay could have used the last decade to create communities around buying, selling, and collecting...taking a slice of any transaction as they turn buyers to sellers or sellers to buyers. They could have offered awards for collector of the month, seller of the month, buyer of the month, and done interviews with the winners. They could have a section called deal hunting where they offer tips on how to find the best deals. They could have a section called "good as new" where people talk where people talk about old items that are a bargain, and in some cases even better than new. They could have allowed sellers and buyers to build editorial communities and collections on the eBay site. Control the conversation and control commerce. What if eBay could have got you to tag just about everything you owned, and then told you roughly what it was worth (based on recent transaction data) and had you put a buy it now price on it? CueCat was a failure, but eBay has a much better platform to market such a device on. Instead they did nothing. They lost a decade to improvements in search, Amazon.com, open source software, blogs, and the rest of the web. Rather than improving their network feedback mechanism and making a deeper network, the new eBay strategy is to try to be more like Amazon, but that won't work. While eBay spent a decade alienating buyers and sellers (with no innovation, shifting fees, encouraging a market lemons, etc. ), Amazon was off building user loyalty. And now Amazon is out working public relations with a holiday customer review team and extending their platform in new dimensions - offering digital downloads, the Kindle, selling utility computing, and selling their shopping platform. Staying competitive is more of a mindset than an event. The decay happens long before it impacts revenue. And by the time it impacts revenue there isn't a lot of time to fix things. eBay, of which I was once a devoted advocate, has done nothing to bring users (both buyers and sellers) together. Instead they have tried to maximize profit while making sure they always stand in the middle of the process. This also stretches to PayPal. They are a classic example of trying to fence people in instead of enabling them. Because of that they are losing the quality sellers and buyers. And, over time, that will mean they will lose other markets too. Those quality and niche buyers and sellers are moving to either dedicated market sites, like Alibris for books, or friendlier blanket sites like Amazon.com's market place. My wife is a clear example of this. She has earned her living off ebay for the past 3 to 4 years, but now she is moving for all the reasons mentioned here. Doesn't having their users write a bunch of books, blogs etc. about doing better on eBay count for at least catalyzing community, if not necessarily giving them the tools to do so? Also, I believe there are eBay forums where the members talk shop. BTW, what's the relevance of that article you linked to on losing a decade? That's about companies sucking it up in the stock market and you seem to be getting at them losing the initiative over a decade of the arms race with other web titans like the Borgle. They never allowed their merchants to create STRONG brands within the eBay brand. Amazon will let you use their software to create your own shop. Google indexes a lot of content from many different sources, even if they don't make money directly from doing so. The relevance of the investing article I linked to was that just as some stocks lost a decade in value, so did this eBay when they are compared with Amazon and Google. I think the same was true with yahoo and Google. Where yahoo is still not accepting outside US residents as their publisher and because of that they loos thousands of webmaster as their advertisers. 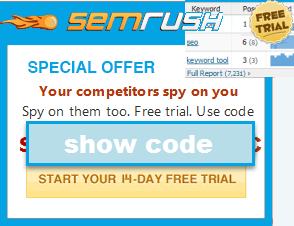 As lot of webmaster use part of their ad earnings for advertising in non ranked keywords. Yahoo has to come out with something innovative so that more webmasters will use their search box, more webmasters and business people will join them as advertisers. I suspect CraigsList has also slowly been eating away at Ebay. eBay have pissed away all the goodwill they ever had by trying to turn themselves into a poor-man's Amazon. If I was a betting man, I would say that there is someone out there getting ready to launch a feasible competitor. Sure, eBay have the "network effect", but people are looking for a better "eBay" now to relocate to. If Amazon only would allow you to track unique SubID's then there's a ton more money to be made for affiliates. The main problem is that I can't create PPC campaigns for niche products because I never know what ad/demographic/time/keyword worked. after sneaking into their craigslist stake, you'd think eBay would have learned their success is because the users are happy. "Years ago, I gave a presentation to the Wal-Mart Internet team. They gave me a tour of their offices, which featured a huge banner that read YOU CAN'T OUT-AMAZON AMAZON. At the time, Wal-Mart was more than 100 times bigger than its smaller competitor in Seattle. If Wal-Mart was afraid to go after Amazon, what chance do you have against your entrenched competition?" I think it's great advice. Unless your in a market where you compete solely on price (which is not a market I would like to be in) then you need to be doing something different to your competition. Not trying to be them. Even if that doing something different is doing things better. Ebay has been in decline for years, but it's like the High Street - you can see it a long time before the newspapers pick up on it or the financial results indicate it. It always amazes me that the last people to perceive this decline are the bosses of the big companies. Like Yahoo - dead in the water with me years and years ago just for it's overall attitude, which indicated a deep rot. The mindset of a company is everything, and the skill is to look for clues and then to hunt backwards. With Ebay, throwing away a couple of billion on Skype and then the CEO making light of it in an interview led me to question what was going on in the heart of the company. That was just one example. Going to the forums and reading about feedback, reading up about PayPal - it was all there. Figure out the mindset of the company and then project ahead. I'm surprised you think Amazon's successful. It looks to me to have lost its way. If it's just another shopping channel then in the UK it'll be competing with Argos and Tesco plus all the other smaller supermarkets. The US Amazon might survive, but I can't see the country-specific Amazon surviving. Every town has it's own corner-shop Tesco, and they're a savvy company. If they wanted to take Amazon.co.uk on across a broad range of products I think they'd beat them. Where I live unless you leave at the right time of day you can eat an hour or two of traffic either way. Home delivery in that sort of market is a value add...Amazon.com discounts and no sales tax are extra bonuses on top of that.